There are adiabatic factoring algorithms and methods. Dwave is focused on optimization problems, however the system can be used to solve other problems including factoring. In November 2014, it was discovered that this 2012 adiabatic quantum computation had also factored larger numbers, the largest being 56153. 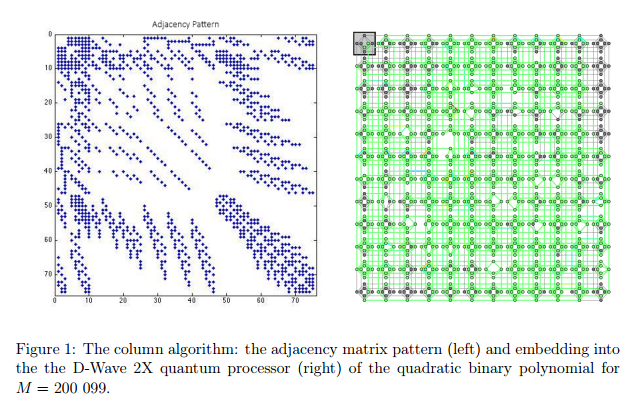 A paper in 2016 discussed factoring with Dwave using about 900 qubits up to 200099 (about 20 bits). Extrapolating to 2000 qubits would be 40 bits. The latest Dwave has 2000 qubits. In 2014, the highest RSA number factored on a classical computer was RSA-768, which has 768 bits, and took two years to compute (from 2007 to 2009). Quantum adiabatic optimization is a class of procedures for solving optimization problems using a quantum computer. • Design a Hamiltonian whose ground state encodes the solution of an optimization problem. • Prepare the known ground state of a simple Hamiltonian. 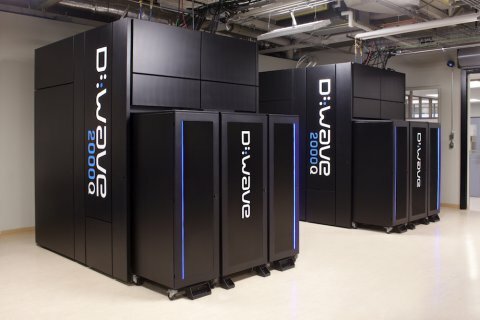 D-Wave Systems Inc., the leader in quantum computing systems and software, today announced general commercial availability of the D-Wave 2000Q quantum computer. D-Wave also announced the first customer for the new system, Temporal Defense Systems Inc. (TDS), a cutting-edge cyber security firm. With 2000 qubits and new control features, the D-Wave 2000Q system can solve larger problems than was previously possible, with faster performance, providing a big step toward production applications in optimization, cybersecurity, machine learning, and sampling. Arxiv – Prime factorization using quantum annealing and computational algebraic geometry (2016) Note this is a public paper. The NSA has worked with DWave systems. I would believe the NSA has more efficient quantum annealing prime factoring algorithms. We [researchers] investigate prime factorization from two perspectives: quantum annealing and computational algebraic geometry, specifically Gr¨obner bases. We present a novel autonomous algorithm which combines the two approaches and leads to the factorization of all bi-primes up to just over 200 000, the largest number factored to date using a quantum processor. We also explain how Gr¨obner bases can be used to reduce the degree of Hamiltonians. has 1100 qubits with a 95.5-qubit yield. To embed the problem graph into the hardware graph we used the sapiFindEmbedding and sapiEmbedProblem modules, and to solve the problems we used the sapiSolveIsing and sapiUnembedAnswer modules. For all problems they opted for the maximum number of reads available (10 000) in order to increase the fraction of ground state samples. The following table shows some statistics of the embedding and solving stages for several of the highest numbers that we were able to successfully embed and solve. Prime factorization is at the heart of secure data transmission because it is widely believed to be NP-complete. In the prime factorization problem, for a large bi-prime M, the task is to find the two prime factors p and q such that M = pq. In secure data transmission, the message to be transmitted is encrypted using a public key which is, essentially, a large bi-prime that can only be decrypted using its prime factors, which are kept in a private key. Prime factorization also connects to many branches of mathematics; two branches relevant to us are computational algebraic geometry and quantum annealing. They used two single-bit multiplication methods of the two primes p and q. The first method generates a Hamiltonian for each of the columns of the long multiplication expansion, while the second method generates a Hamiltonian for each of the multiplying cells in the long multiplication expansion. The paper used about 900 qubits.